A hilarious video shared by police shows the man during the incident, knocking a display case onto himself while trying to pull out a phone. A screengrab from a video shared by Westland Police. Authorities in Westland, Michigan, are looking for a clumsy crook who managed to upset a whole display case over himself during a robbery. 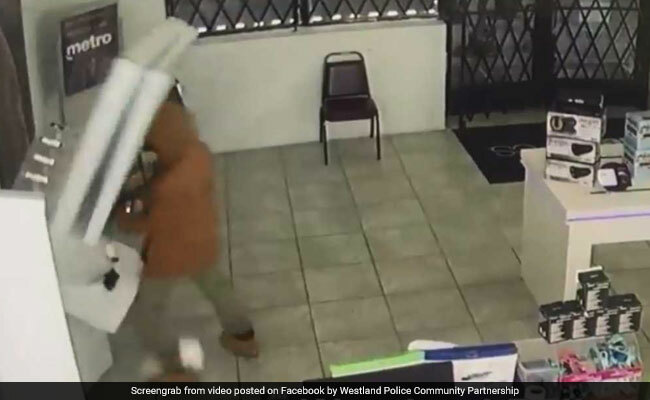 A hilarious video shared by Westland Police on Facebook shows the unidentified man during the incident, knocking a display case onto himself while trying to pull out a phone. The CCTV footage was shared in hopes of identifying the bungling criminal, and it has left plenty of netizens very amused. In the video, the man, dressed in a tan-coloured jacked with khaki pants, is seen entering the store and grabbing multiple cell phones. In one instance, as he attempts to pull out a off of its security device from a shelf, the whole display case topples and falls over him. The incident occurred on March 4, though the video was released only on Tuesday by Westland Police. Since being shared online, the hilarious clip has collected a ton of amused comments, along with hundreds of 'shares'. "Almost knocked himself out trying to get a display phone... won't be long till you get him," predicted one person in the comments section. "Totally laughed out loud. I hope you catch him!" wrote another. This is not the first time that surveillance cameras have managed to catch clumsy thieves in action. In April last year, police in Florida shared a video of a thief who hit his head and dropped the cash register while fleeing a doughnut shop.